One-third of all American presidents have set foot in town as have hundreds of internationally known entertainers, artists and politicians. In 1910, Col. William F. Cody, better known as Buffalo Bill, stayed at the old Continental Hotel at Broad and Division streets. He had come East as a star attraction with one of the rodeos that helped him gain fame. For many years an oil painting of Bill has had a place of honor in the building, which later became the Hotel Benzell but disappeared in modern times. Restaurateur Eddie Dwyer often recalled how rodeo stars stayed at the hotel rather than in New York City, because Newark was less intimidating to 'country boys' than Manhattan. The hotel also provided easy access to New York by way of the old Morris and Essex Railroad, later the D. L. and W. (Delaware, Lackawanna, and Western), and now New Jersey Transit. Louis V. Cooke of East Orange expressed admiration for Cody as an 'almost legendary figure who was a frequent visitor to the area around the turn of the century.' Cooke, whose father worked as Buffalo Bill's press agent, had a boyhood job tacking posters and handbills on barn walls, in barbershop windows and all around town announcing the coming of a new show. ''That job sure made me a hero among the kids at the Summer Avenue School,' he said. Before Cody's final appearances in Newark and New York City at the old Madison Square Garden, he performed in Europe, including a command performance for Queen Victoria. He also played Germany, Italy, Austria, Hungary, Holland and France. Cody's last engagement at Madison Square Garden was on a great white stallion lent by Homer Davenport of Morris Plains. He died in 1917 a comparatively poor man, but he was richly remembered by local children who loved being in the same auditorium with the great Buffalo Bill. 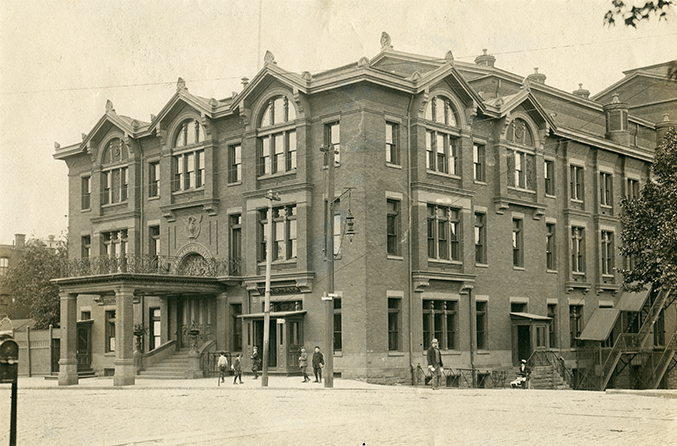 Sarah Bernhardt appeared at the old Newark Theater in Market Street in 1903. 'The Divine Sarah' was in town only one night, thus the crowds were enormous. Patrolman August Harms was assigned to protect Bernhardt that evening on his Market Street beat. As throngs gathered at the theater's stage door, she decided to leave through the lobby, creating a panic. Harms literally picked her up and placed her in a waiting car for which she 'thanked him profusely, drew a large bloom from the bunch of roses and handed it to him, 'Do keep this.' And keep it he did. The perfectly preserved rose was pressed in the family Bible for years only to be re-examined again at the news of her death in 1923. Perhaps even today, almost a century later, it is still hidden away by some modern-day romantic. Walter Damrosch's half-century musical career began in Newark as permanent conductor of the New Jersey Harmonic Society. Yet he is mostly remembered for helping to found and conduct radio concerts for public schools and colleges. In 1903, he left Newark to establish the New York Symphony Orchestra. In 1919, at the urging of Gen. John J. Pershing, he founded a school for Army bandmasters in France. For 19 years he was musical counsel for the National Broadcasting Co. As a conductor, Damrosch is thought to have premiered many of the works of Tchaikovsky, Saint-Saens, Berlioz and Wagner for American audiences. His compositions included 'Cyrano,' 'The Dove of Peace, ' and 'The Scarlet Letter.' From 1940 until 1948, he served as president of the American Academy of Arts and Letters, making him one of the most publicized figures in American Music in the 20th century. Nobody was better known for teaching the joys of music appreciation than Damrosch. President Franklin Delano Roosevelt visited Newark several times. His funeral train, like Abraham Lincoln's, passed through the city on its way to his final resting place. In 1932, Roosevelt came here on a campaign trip and was cheered by 200,000 gathered along Broad Street. His second journey was on January 19, 1936, for the purpose of 'thanking the men and women who have taken leadership in New Jersey in furthering the New Deal programs.' More than 5,000 braved terrible winter weather to catch a glimpse of the President and the first lady as they arrived at Pennsylvania Station. Their party was greeted by Gov. Charles Edison and Mayor Meyer Ellenstein. More than 1,000 people stood in the freezing rain at the station to see the visitors before they left by motorcade for the Robert Treat Hotel. The President wore no overcoat and was surrounded by a large group of officials including Edward W. Starlin of the Washington Secret Service office and William Morris, his Newark counterpart. On leaving the railroad station, the motorcade 'sped across the plaza toward the hotel' in several cars as the crowd jockeyed to catch a sight of the party. Secret Service guards preceded the President's car, standing on the open car's running board surveying the crowd for any signs of trouble. The entourage stopped several times so that the President, always smiling, could wave to the cheering crowd. Following a meeting at the hotel, the Roosevelts returned to Penn Station for the 20-minute trip to Manhattan and their eventual destination, their 65th Street, New York City townhouse. The first lady arrived June 4, 1937, to address the Essex County Symphony Society at the Essex House on Lincoln Park. Accompanied only by a secretary, she apologized for her late arrival at Penn Station and immediately went to meet Mrs. Parker O. Griffith, one of the most important Newarkers of that era. Mrs. Roosevelt wore a chiffon dress, a large natural straw hat trimmed with violets, the New Jersey state flower, and patent leather pumps decorated with steel-cut buckles. Her message was one that isolationist America did not necessarily want to hear—that America might be drawn into European affairs, especially to assist friendly nations not as well off as the United States. While a social event on the surface, Mrs. Roosevelt's words mirrored her husband's feelings on the subject of international relations. Hers was not a steel-fisted delivery of demands, but it clearly indicated the direction in which the country was moving as the war clouds hovered. On April 10, 1941, Gen. Wadlislaw Sikorski, premier of the Polish government in exile, arrived in Newark to the shouts of 'Niech, Polska, niech Sikorski'—Long Live Poland, Long live Sikorski. The crowd at Penn Station was estimated at 5,000. Alina Michalski presented the general with a bouquet of roses and, a reporter recounted, 'laughing-eyed girls, costumed in the colorful krakowiac and mazur of the Polish folk dance, gaily threw kisses at the visitor.' Nevertheless, the grim reality of the situation was recalled by Sikorski, whose Poland had been captured by Hitler's soldiers and its people put in chains. Sikorski predicted that 'a new tide will surge through the world and the free people will join to defeat Hitler. While Hitler was arming, the free people were disarming. This war is not a war for Poland, Belgium, Holland or Czechoslovakia, it is a war for the freedom of humanity.' Following his jubilant welcome at the station, Sikorski was taken to City Hall where he received the keys to the city and talked with Commissioners Murphy and Franklin about the contributions to Newark made by Polish heroes Pulaski and Kosciusko. ''I am quite confident that this great country will fulfill the great role and undertaking history has placed before it, in a formidable way,' the general said. After leaving Newark he made a quick trip around the rest of the state, meeting with Gov. Thomas Edison in Trenton. In Jersey City, he received an ambulance from Polish groups which was turned over to a British-American ambulance corps.